Chitose Abe has continued to build her unconventional and sophisticated aesthetic with the new Sacai collection. For example, the runway show included the signature controlled reconstructive designs. Her use of exquisite pattern mixing, slicing, and modern femininity was certainly well received. Her expertly created chaos was held together by belts and sleeves tied across the chest. Because colors were combined so elegantly, even pieces with multiple layers, patterns, and textures were cohesive. Chitose Abe adds choppy and uneven pieces of fabric that peek through in different layers, which is probably her approach to the ruffle trend. On one hand, prints such as florals and plaid were frequently used, while vertical stripes were made with mixing different colored textiles spliced together into one garment. On the whole, the collection remained fresh but consistent; this is likely due to her design process. Santa Fe Dry Goods + Workshop carries a selection of garments from casual tops to stand out pieces, which highlights the versatility of Sacai clothing. Specifically, a standout piece is a green and teal linen and polyester top with western influences. 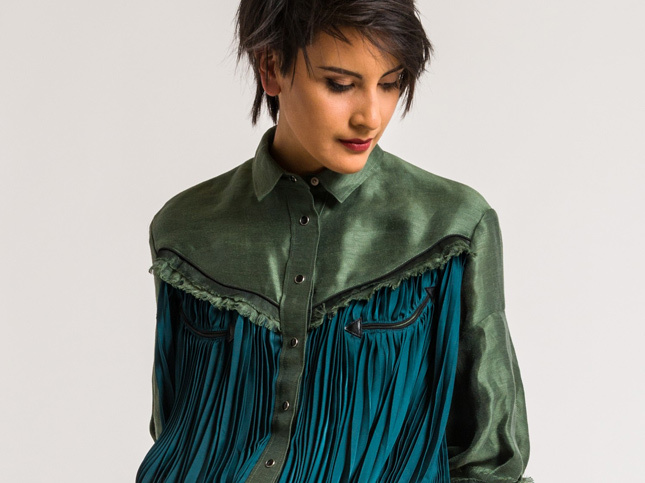 From a green linen yoke, satin teal pleats fall elegantly down the body. Rather than being over the top, the linen is finished as a raw frayed seam. Her western influences were more explicit in the Menswear Spring/Summer 2018 runway show. Yet, the runway shows that unisex designs have steadily growing in fashion. 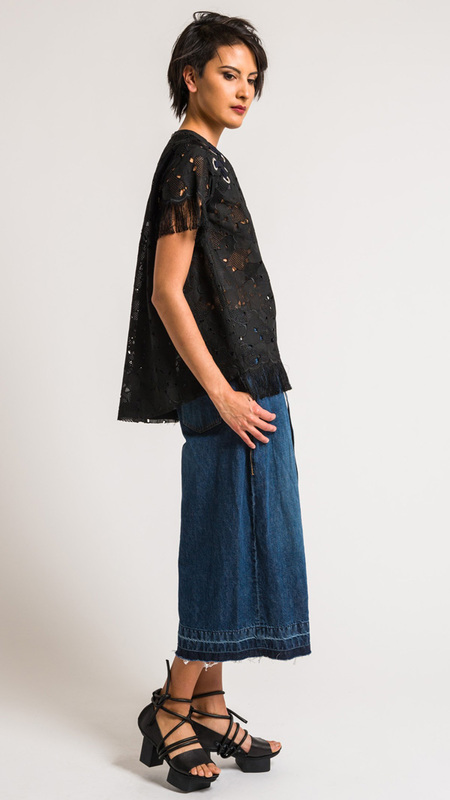 Second, the embroidered heart lace top with fringe is another notable piece. Paired with the wide leg denim pants, the style is both edgy and feminine. In fact, any of the tops can be used in similar styling. No garments are boring; this is true for any piece. At first glance, a button-shirt is normal except for its pleats subtly hidden by its stripe print, or a lace drawstring is the hem. The wearer can use these trick-of-eye surprises for versatile styling.